Well, after a break I think some of you might be groaning to hear that I’m coming back with yet another Tiki drink. But wait! It’s so much more than that! It’s…. got Mezcal in it. Oh yeah I did. In making this drink I realized that Mezcal on its own CAN work with the world of Tiki, and also, when you add Cruzan Black Strap Rum to the drink, it’s total magic. I’m happy I took a little break, I feel like I cleared out the cobwebs and have some great ideas I want to work with. You should do that too. Go take a mental break. Admittedly the name came WAY before the drink. I have an Evernote notebook filled with just names of drinks I should make some day because at the time I thought they were clever. I clear it out frequently. Cause a lot of the times I’m drinking coming up with these and you know, it’s not the same the next day. Why would you name your drink the Canine Chasm? What the hell does that even mean? This cocktail started as a variation on the Jungle Bird, but then flew off in another direction. Campari, with its bitter citrus flavor seemed a good candidate to start mixing with Mezcal. It is, FYI. The only issue I ran into here was trying to photograph a flame; a liquor flame. It’s blue and in daylight fades, and at night, you can see it but not the drink. Frustrating, but after some tips from a bartender the other night, I will have to go at it again with some minor adjustments to my camera (I’ve unlearned a lot of my photo skills from college apparently). For this post you’ll have to just accept the shaky garnish and Oh and AH at the only picture to come out IN focus WITH a flame in it. But really, the drink will more than make up for any displeasure the image causes you. If you are interested in creating a drink there are several techniques for creating a flame that lasts a bit while you imbibe. 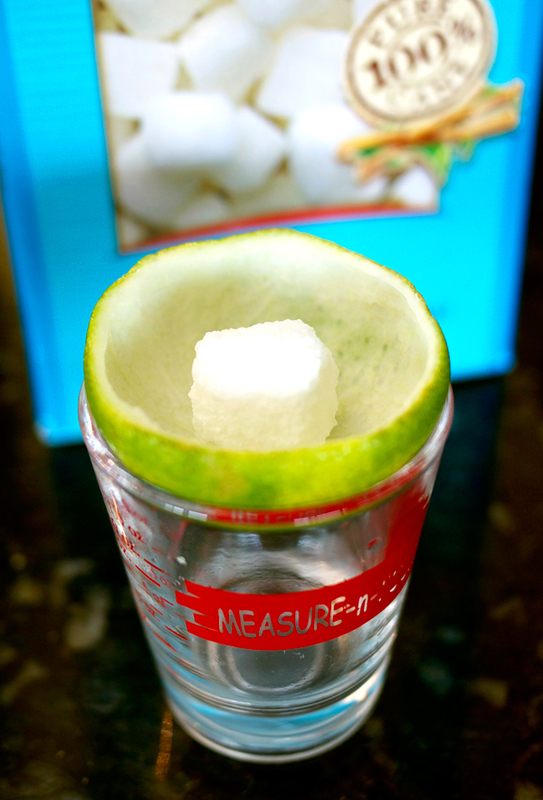 One method is to use a toasted cube of bread doused in 151 rum, another is to soak a sugar cube in the same 151. I chose the later; it smells good. Also, if you want to really create a WOW effect, sprinkle some cinnamon on top, it will crackle and pop a bit. And also smell good. Combine all ingredients except garnish in a shaker 2/3 filled with ice. Shake well to combine and pour, strained, into a chilled coupe. Garnish with pineapple wheel with flaming sugar cube on top (either way above will work). Try not to burn eyebrows. This cocktail blends in a very interesting way flavors you associate with tropical, but with a more savory base from the Mezcal. Very dry, slightly sweet with an added molasses depth that I’m finding hard to explain HOW AWESOME IT TASTES. 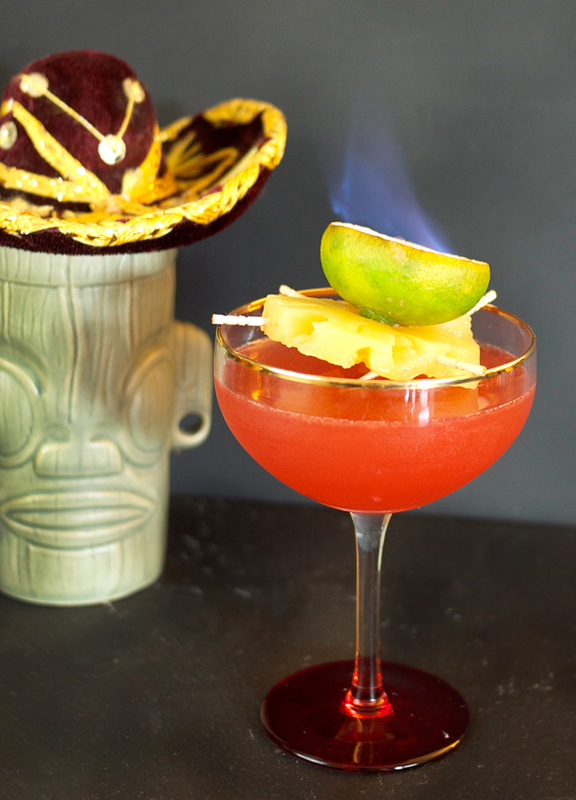 Fruit flavors are subtle with a balance of smoke from the Mezcal. In the first variation of this, I left out the Cruzan Black Strap rum and the drink definitely had a much stronger punch of smoke. However, when it was added to the cocktail, it balanced everything out in a way I wasn’t prepared for since I was expecting more sweet. Check out the Death to Sour Mix site for the post on MY SITE. It was badgers, not weasels. FYI. And if you like music, you should follow my twitter feed, as I’m doing a song a day for the next year. Committed, that’s me.